The reason I am writing about the Garmin Forerunner 310XT is because when I am on the boat, I like to get exercise and unless I can track my distance, I tend to cheat. So, I got this tracking device 18 months ago from Mountain Equipment Co-op and it has been very reliable. I have used the Garmin for kayaking, cycling, running, walking and even for swimming (although I’ll need to go over the pitfalls for underwater) and its accuracy is amazing. You turn it on and wait for it to find the satellites. If you’re moving around, it does take quite a while (sometimes five minutes or so) to find the satellites, but if you’re holding still, then it usually only takes a minute. Once the satellites have been located, you press Start, and away you go! Your distance as well lap speed is recorded. I find that it is clunky because it is so big, so if I am running, I don’t keep it strapped to my wrist. I just hold it in my hand. Probably someone who is a bigger person would not have a problem with it. When I use while I am kayaking, I just lay it down on the kayak (in the cup-holder) and watch my progress. As for biking, I just attach it to my front bike bag. I did use it for swimming, but it was not that great because every time the Garmin goes underwater more than a foot or so, it loses the satellite and has to find it again so it was not terribly accurate. Also, I worried about it falling off my wrist and if I lost it in Georgian Bay or the North Channel, I’d never find it again. The battery time for the Garmin is pretty good, about 4 – 6 hours. It is a good idea though, to check the level of the battery after each use so that it can be recharged as that takes quite some time – well over an hour if it is drained. As for uploading the data, that works well except again, it takes quite some time. What you have to do is plug a little USB device into your computer, turn the Garmin on and then put it near the USB. 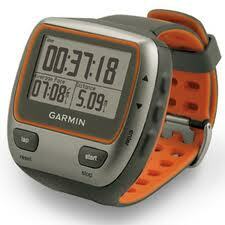 The Garmin will sync itself and upload the data onto the Garmin website (you have to create an account). You do need to have Internet to upload the data and it takes about ten minutes or so. However, everything is stored – all my info is there since I bought the device in June 2010. You can download spreadsheets and also check out your routes on Google Maps, so there’s a lot that can be done. The Garmin failed on me twice – once while I was kayaking at Covered Portage Cove – the screen went a little wild so that I couldn’t read it. I turned the Garmin off and on but that did not help. After about half an hour, it fixed itself and I don’t know what it did. I also had an incident in the fall where the Garmin would turn on but not show anything on the screen and I thought it was broken. I then thought I should sync it with the website, and it downloaded new software which made it work again, so I guess it is important to keep the software updated. It hasn’t let me down since and I’ve used it quite a bit for running and for skiing. All in all, I do like it and it works everywhere we’ve been, so I would recommend it if you need to know your distance and speed. It is very accurate and does let you set goals. It is pricey but it really helps, especially if you are getting cabin fever because you’ve been on the boat too long and have not been getting enough exercise. So, it is worth it! Hi JH, I am impressed with your blog!